Our Community Accountant Claire Welling has collected the Adrian Randall Challenge Prize at the Charity Finance Group’s Annual Conference. This prize is given for helping with best financial practice in charities. Our E-learning package which is suitable for trustees, finance workers and volunteer treasurers has won us the prize. 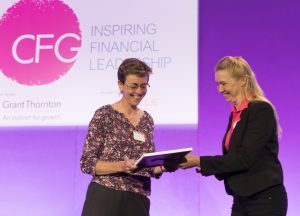 The Charity Finance Group’s Conference was at The Queen Elizabeth II Centre in London and Claire was handed the prize by Caron Bradshaw, CEO of CFG. She collected a framed certificate which comes with a cash prize of £5000. WYCAS plans to use the money to support individuals by way of bursaries to be able to take our E-learning course. Claire Welling, Leeds Community Accountant and the team at WYCAS, have developed the learning materials which are available through a Moodle E-Learning site. The Financial Practice and Procedures course requires 30 hours of student learning time. To give the training real value to the learners in terms of their CV, it is accredited by Open Awards (a national awarding organisation) at level 3. It uses quizzes, examples, videos and other E-tools to explain the themes. For further details on our E-learning course see here where you can access a sample E-learning quiz. If you have any questions please call us on 0113 270 6291.